J.T. 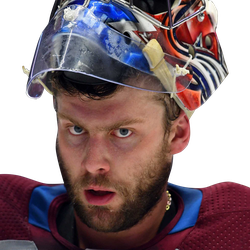 Compher had two goals and an assist, including a tiebreaking goal on a breakaway with 5:22 remaining in the third period as the Colorado Avalanche held on for a 5-3 win over the host Chicago Blackhawks on Friday night. Carl Soderberg also scored twice for the Avalanche, who won their third consecutive game and broke a tie with the Blackhawks in the Western Conference standings. Gabriel Landeskog added a goal and an assist for Colorado. Chicago threatened to force overtime with a six-on-four advantage in the final two minutes, but Soderberg sealed the outcome with an empty-net goal with 33.3 seconds to go. Avalanche goaltender Semyon Varlamov, who had 41 saves, made the lead stand. Colorado opened the scoring with 3:51 left in the first period. Soderberg sprinted into the offensive zone and punched in a forehand shot for his 20th goal of the season -- the first time he has reached the milestone in his seven-year career. Chicago evened the score in the second period when Dylan Strome knocked in his 16th goal of the season and 13th since arriving in a deal with the Arizona Coyotes on Nov. 25. Strome tracked a rebound and scored from the side of the crease while on the power play at the 10:48 mark. A series of sharp passes helped the Avalanche regain a 2-1 lead while on the man advantage with 1:55 left in the period. Landeskog fed a pass to Mikko Rantanen, who quickly flipped the puck to Compher for the score. Kane made it 2-2 only 84 seconds later. He buried a shot from the right circle for his 39th goal of the season. Landeskog put the Avalanche on top 3-2 early in the third period. He ripped a rising wrist shot for his team-leading 32nd goal of the season. For the third time of the game, Chicago erased the one-goal deficit. Alex DeBrincat knotted it at 3-3 when he scored on a second effort in front of the crease for his 34th goal of the season and fifth in the past three games. Blackhawks goaltender Collin Delia finished with 26 saves on 30 shots.